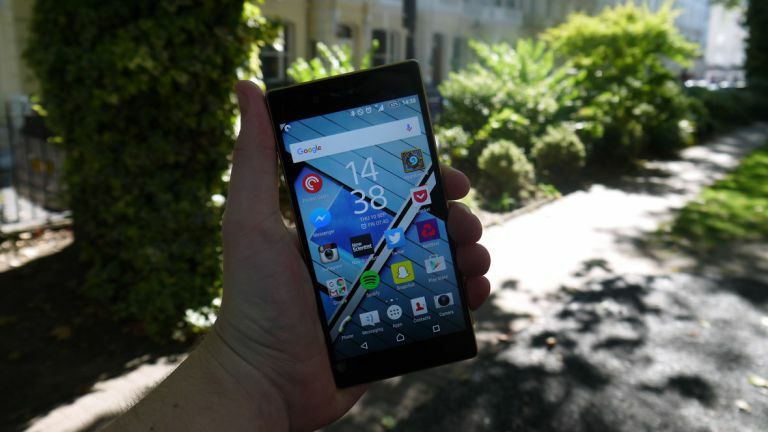 Sony Xperia Z5 review: would Bond really use this phone? Sony has a new flagship phone for you and surprisingly things have actually changed. It's not the hyper-innovative new Xperia Z5 Premium but it does include a load of new features and a new and improved design that may excite you more than previous Sony models. Sony's Xperia Z5 is here to make up for the mess that was the Xperia Z3+. That phone was an overheating shambles that barely innovated on the generation before and just garnered bad attention for the Xperia brand. It made no sense to release a phone six months after the last version, and the overheating issues just proved that Sony was pushing it out of the nest too early and it just fell to its death. Sony is playing catch up in terms of design right now. A lot of the rest of the phone market looks gorgeous to hold and feels premium; the high-end devices thing is what the Japanese company wanted to own. And for once this feels like Sony is going to stop creating a new phone every half of a year and stick with this one as, shock horror, it's actually pretty good. On first look, the Xperia Z5 looks remarkably similar to the Xperia Z3+ and everything other Z model that went before it. But when you dive a little deeper you'll realise this phone is really rather different. The fingerprint magnet back of the Xperia Z series has been dropped for a frosted glass effect that looks and feels great in the hand – it looks much more premium just by painting over the back and introducing a new colour scheme. Edges of the phone have been rounded to feel much more comfortable on your palms. The square design isn't going anywhere soon, though if you want truly round corners you want to be looking at the iPhone or maybe HTC One M9. Sony has included a fingerprint sensor for the very first time on its Xperia Z range, placing it in the power button for easier access. As such that's been moved down to the middle of the right-hand edge and the volume rocker sits just below it. I really don't see why though – it makes it much harder to hit when you're using the phone and that's a big design flaw. It just feels like no-one actually tested the handset out to check whether the positioning worked. Apart from that though, everything looks and feels great on the Xperia Z5's design front – something that Sony couldn't really say before. Holding a Sony Xperia Z phone is finally something people will be impressed by, that's only a good thing. Whilst a lot of the rest of the mobile industry is going 2K crazy on their phones, Sony has just sat back and left the screen at Full HD. Well, it's not strictly true as there is the Xperia Z5 Premium coming that features a 4K resolution screen – the first ever on a smartphone – but for the Xperia Z5 it's been left as it was. I assume that's to offer a better battery life. It's a 5.2-inch screen with a pixel resolution of 1920 x 1080 equalling at 428ppi. It's nothing on the Xperia Z5 Premium's 806ppi but it's still an impressive number. Video and, well just about everything, all look great on the screen that seems even brighter than the earlier versions of the Xperia Z range. I'm really impressed with what Sony has managed to achieve without actually upping the screen tech itself – viewing angles even seem better than before as they weren't strong on the previous phones. It's a shame there's no 2K display here but that extra resolution is a big battery eater on other products and if you're in search of pixels you may want to go to the Xperia Z5 Premium when it launches in November. New features on the phone include a fingerprint sensor for the first time. That means it's much more secure to unlock your phone and the Xperia Z5 is pretty speedy at working out it's you. You can set up five of your digits to be read by the sensor so you're not restricted to a particular holding position, but that said it's not simple to use when it's laying down. It's inside the power button on the right hand side of the handset so it's not simple to unlock when laying on a table. An iPhone 6S is simple to unlock like that as the TouchID sensor is on the front. It's pretty fast at doing so as well, I never had any issues with the fingerprint sensor on here and that's a real surprise considering most manufacturers don't get it right on their first attempt. Sony is the only phones manufacturer right now taking a big punt on waterproof design. The Xperia Z5 is no less waterproof than the rest of the Xperia Z range but it's only got one flap this time to cover up the microSD and nano-SIM slot. It's handy to be able to take your phone in the shower or out in the rain and not having to worry about it being damaged. Recently I was at a party that turned out to have a foam cannon – if I had any other phone in my pocket I may have been worried but the Xperia Z5 survived the night with ease. Another key feature is PS4 Remote Play. If you've got yourself a PlayStation 4 you'll be able to play it on your Xperia Z5 screen, as long as you're on the same Wi-Fi. I tried it out here with a couple of different games. It works best for indie titles with a slower pace. Games like Rocket League are quite difficult to play down to the speed of the game, and don't expect to be able to read an RPG's long menus at 5.2-inches though. Sony has scattered adverts all over the UK claiming the Xperia Z5 has the best camera on a smartphone right now. That's a big ask with competition from the likes of Samsung's Galaxy S6 and the iPhone 6S out in the wild, but it's certainly more impressive than what we've seen from Sony before. There's a new autofocus feature that can take your snap in 0.03s meaning when you've got a slight tremor it can still take that perfect shot. It works really well but isn't going to work if you're spinning around in circles - it's just effective for when you haven't got a steady hand. There seems to be a lot of light within images this time around – but it's still not the best out there for getting vibrant shots. Samsung's Galaxy S6 camera is still stunning when it comes to taking big shots and although Sony has an incredible resolution in its images, there's just something a little less exciting about the images. Technically they're excellent - but perhaps you'll look at something on the Samsung or LG phones and feel wistful. The Xperia Z3+ had some big issues - it overheated, apps crashed and it sometimes got too hot to touch. The Xperia Z5 uses the exact same Qualcomm Snapdragon 810 processor set up with 3GB of RAM, but it seems Sony has worked out the issues. I've tested the phone extensively playing lots of games, watching a lot of video and running multiple apps at a time and never found any issues. The phone certainly gets hotter than some others on the market but none of the apps crashed and it never got unbearably hot in the hand. Plus it actually handled all the content pretty well – I found it running a number of high-intesity games perfectly with no real issues to be found. Batteries in smartphones are still not up to the level we'd expect right now. There's nothing really long-lasting in the flagship space and the Xperia Z5 is much of the same. It's good, but it's not great. I found it would give me an average day's use but if I did any kind of hard work on the phone I found it would be flopping before the end of the day. We do a video test with our phones here and an hour and half long video on full brightness and connectivity on gave an end battery level of 75%. It's better than the Xperia Z3+ that came out with 62% at the end of the test but when you compare it to the 84% that Samsung's Galaxy S6 had it sounds quite pathetic. There's no fast or wireless charging option here either – so once you're out, that's it. You've got to go back to plugging it in and it isn't going to be as fast as say TurboCharging up a Moto X Style. Sony's Xperia Z5 is a remarkable improvement upon the Xperia Z3+ and is going to make any fan of the range a happy bunny. It looks stylish with a new thought-out design that really differs from the pack without being an ugly mess. Whether it'd be a real James Bond's phone of choice I'm not entirely sure, but it certainly looks and feels great to the touch. It is one of the best performing phones on the market as well – being able to tackle the overheating issues has proved how good Sony is generally at making phones that can handle almost anything you throw at it. The camera improvements are appreciated and the battery life has improved hugely upon the Xperia Z3+ to make it one of the best-performing on the market. We can only hope that Sony stops, sits back and looks at what it has achieved here. If the company can pause for a moment and stick to one smartphone it may be able to sell quite well – and if any phone is going to do it, it's the Xperia Z5.